Voters can add comments to individual ratings in either the single or multi view Ratings screens. User comments are recorded and can be categorized using user defined labels or categories. Decision Lens provides a few preset options such as: Major / Minor > Strength / Weakness. Comments can be compiled and output for later discussion and review by decision participants. To enter a comment, click on the Comment Icon to reveal the comment side panel. Type into the text box on top and then use the drop downs to categorize the comment. Then click the Submit button to record the information. The Portfolio Owner can select from options to show / hide comments to the group of participants. 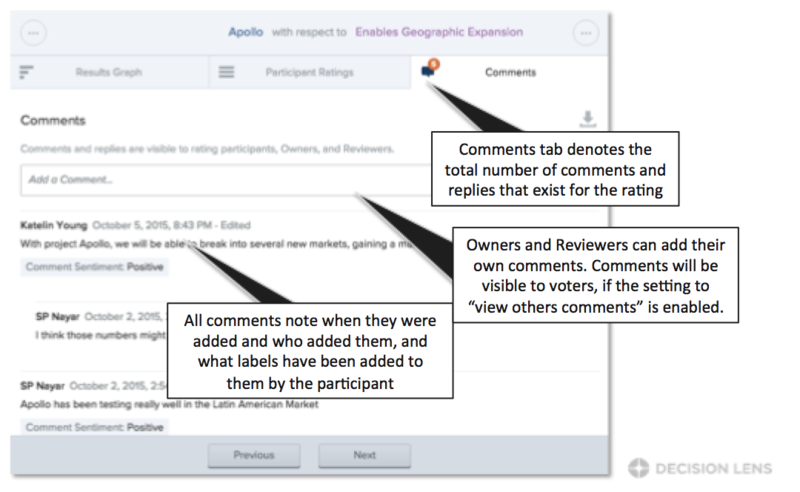 When comments are set to public, users can see and reply to other users comments. Once comment is saved, comment will display along with timestamp and ability to edit/delete. Comments can be used to ask questions of the group or provide additional rationale for "WHY" they think that the alternative performance justifies the selected rating. 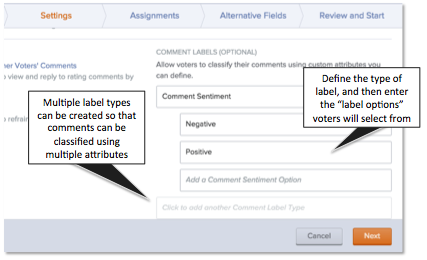 Comment labels can be created to allow voters to classify their rating comments. Labels can be edited or deleted at any time. Deleting a label, will remove it from any comments voters have attached it to. To drill down into the results for a single alternative, click on the Alternative Name in any of the Ratings Results views or use the Jump to Results bar and select an Altnernative with respect to a Criterion. The Comment Tab can be used to view all rating comments from participants and allows Owners and Reviewers to add their own rating comments and replies.